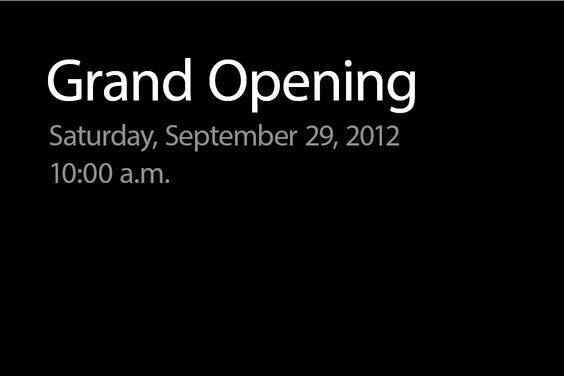 Apple’s second retail store at Festival Walk opening this Saturday, see you all out there. Emily Soto is an up-and-coming international fashion, celebrity and lifestyle photographer based in southern California. Since beginning her career only two years ago, her work has been chosen by editors to grace covers of countless magazines on newsstands worldwide. In the process, she has gained tens of thousands of followers on Facebook and receives thousands of hits a week on her website. Emily is handpicked by fashion editors to shoot their models and has experience working with the top model agencies and clients. She is sponsored by Mola lighting and last year received a “Best of Photography” award from Sigma. Emily collaborates with creative directors to create one-of-a-kind photographs, whose look, feel and style sets them apart from everyone else. Soto also does her own editing so that from its inception, each photo is truly her creation. Emily cites Tim Walker as an inspiration for her whimsical, dream-like images. ”I absolutely love what I do,” Emily says. “To me, it just comes naturally, so I decided a couple of years ago to do what I love full time. Emily will embark on a multi-country tour this summer and lead workshops across Asia that includes Singapore, Hong Kong, Philippines & Malaysia. PASM Workshop will be hosting Emily’s Soto‘s Seminar and Workshop Tour 2012 in Hong Kong on 25 and 26 August 2012. Admissions is now open and will be on a first come first serve basis. Emily has now over 35,000 likes on her Facebook Page and her YouTube Video Channel just rocks. First Day: something to write and a pen, DSLR camera with Portrait Lenses. In the range of 50mm to 135mm. Prime Lenses are Preferable but not required as a must. Second Day: Laptop computer with CS4, 5, or 6, Mouse or a wacom table – Please bring your laptop charger as well. To enroll, please deposit the correct amount for the workshop to the following bank account and email us the copy of the deposit slip via return email with subject stating “Payment for Emily Soto Workshop”. Upon receiving your deposit, we will issue you a confirmation. The Workshop Facebook Event Page is up. Emily Soto Fashion Photography Workshop from Purple Glass Studio on Vimeo. The Creative Asia Awards is revolutionary in its vision to evolve, include and educate its entrants. The Awards are open to photographers from all countries at all skill levels. Entries are accepted online as digital images. The entries will be judged online in a pre-elimination round to determine the top 25 images in each of the 8 categories, and all images judged online will receive feedback from the judges. These 200 finalist images will be judged live by our panel of experts during the Creative Asia Conference. [Update: 17 May 2012] Special discount for PASM Workshop members, now for HK$1,980. Email to sales@pasmworkshop.com to enroll. It’s finally here, Andy Strachwsky from unknownphotographer.net is finally bringing his new LIGHT workshop to Asia and PASM Workshop will be hosting the Hong Kong seminars and workshops. S$375 (HK$2,320) for early bird registration, definitely a bargain for a 2-day workshop. Check out the following video where Andy will tell you what this tour is all about. Andy Strachwsky, a lighting specialist and a professional retoucher for many years taught photography, lighting and retouching workshops around the world including Colombia, Ecuador, Puerto Rico, Ireland, Germany, England, Spain, Canada, Singapore, Honk Kong, Malaysia and the United States. He also did a workshop for a company called creativeLIVE which was transmitted LIVE globally over the Internet with thousands of viewers. During the tour Andy Strachwsky will conduct a seminar intended for the beginning photographer. Professional lighting adviser and retoucher Andy Strachwsky from unknownphotographer.net will go over the basics that you need to take your photography to the next level. His simplistic, laid back and real approach to photography is a refreshing breath of air in this industry that is polluted with marketing. Andy will go over everything you truly need to be able to take the photographs you want. He will be talking gear, lighting, composition and how to further yourself in the industry. If you are just starting out and you feel like you don’t know where to go, join us for this one of a kind photography seminar! He will also conduct different levels of photographic and post-processing workshops. Begins by understanding the dynamics of light, explore complicated multi light scenarios using a variety of modifiers. Andy will also cover the topics of color and light, as well as balancing different temperature lights. The whole workshop will feature a high fashion workflow with a heavy lean towards posing and communication with models and pre-visualization as well as a complete understanding of the physics of light with special participations of Fashion Photographer Richard Chen, Beauty & Glamour Photographer Borj Meneses and Stylist Don Cristobal. To sign up and know more about the detailed Itineraries please chose the country you wish to enroll at the following link, http://purpleglassstudio.com/portfolio/andy-strachwskys-light-workshop-tour-2012/. 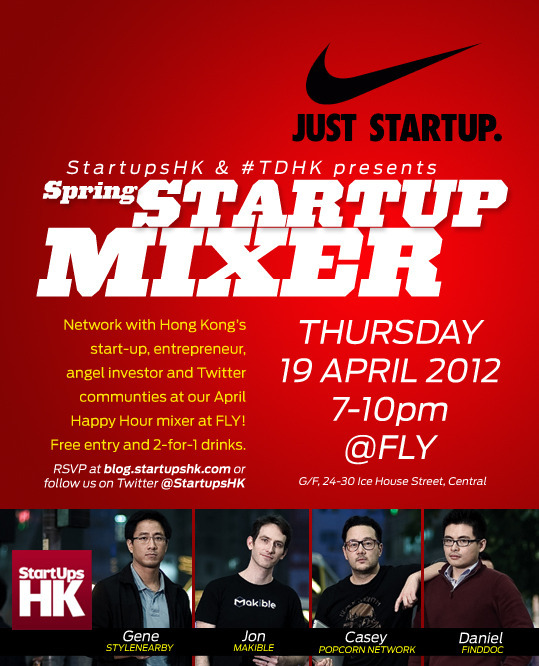 StartupsHK, Hong Kong’s Tech Startup Community us having their spring mixer next Thursday night. They will be having some startups from Silicon Valley in town attending the event, a great chance to network, share stories, talk to angels, find co-founders and have a drink with the startup community that has grown so massively in Hong Kong and was featured in TimeOut magazine recently. Check it out if you’re interested in startups. For more information, check out the StartupsHK blog site here. Was at the Langham Place Short Films Screenings last night and they showcased three feature shorts, namely, the Club, the Spa and the Room and the most interesting part of it is that all three short films were shot with the iPhone. Check out the making of videos here and have a taste of what’s it all about. The other highlight of the evening was when Sean Seah, Vice President – E-Business, Loyalty and Partner Marketing of Langham, announced the Langham Short Film Competition where the winner of the competition will be flown to London, stay at the awesome Langham London, be able to attend an exclusive networking breakfast with the heavy weights of Sundance Institute and other filmmakers, attend Sundance screenings and if lucky, have access to other Sundance panel events as well. So all budding filmmakers and videographers, this is definitely a competition that you want to look into. More information on the competition and the three short films mentioned earlier after the jump….. Yet another art event tonight apart from ArtWalk, this iphoneography exhibit is scheduled tonight at V13 Vodka Bar on Old Bailey in Sheung Wan. Drop by if you have time to check it out or if you are participating in ArtWalk, this is just around the neighbourhood. The next Web Wednesday meet is this coming Wednesday, 14 March 2012, at Bisous Hong Kong, 9th Floor, LKF Tower, 33 Wyndham Street, 0000 Central District, Hong Kong. A regular and vocal member of the Web Wednesday audience, Peter Dingle will be sharing the future of computing, be it tablets, ultra-thin laptops, brain plug-ins or holographic touch screens. Peter is the Interactive Marketing Manager for Intel in APAC so has plenty of great and inside-out stories to share. As per usual, there’s a HK$100 entrance fee, which includes one complimentary drink, an enlightening talk, high-quality networking and the chance to win lucky draw prizes. Participants include Pharrell Williams, Khalil Fong (方大同), Thomas Heatherwick, Philip Treacy, Marianne Faithfull, Daniel Wu(吴彦祖), William Orbit, Nobel Laureate Sir VS Naipaul, Neil LaBute, Paul Schrader, Terence Koh (許漢威), Mike Figgis, Hong Kong New Music Ensemble and many others. Liberatum Hong Kong will bring together international cultural icons, creative leaders and acclaimed artistic minds to Hong Kong to connect them with their counterparts in Asia through an original and captivating programme. After the great success of Liberatum festivals in different parts of the world including Istancool in Istanbul, Liberatum’s founder and artistic director Pablo Ganguli and Liberatum co-founder and creative director for Hong Kong and Mainland China, Rosey Chan (陳小莉) will bring leading artistic personalities from the world over to Hong Kong, with a programme aimed at captivating and opening global minds. Some of the participants confirmed to attend include legendary singer Marianne Faithfull, Grammy Award winning producer, musician and designer, Pharrell Williams, renowned American screenwriter and filmmaker Paul Schrader, innovator and visionary architect Thomas Heatherwick, Nobel prize winning author Sir VS Naipaul, photographer Wing Shya (夏永康), singer Khalil Fong (方大同), fashion icon and hat designer Philip Treacy, Grammy Award winning record producer and musician William Orbit, composer and pianist Rosey Chan, Chinese-Canadian artist Terence Koh (許漢威), actor Daniel Wu (吴彦祖), American film director and playwright Neil LaBute and Academy Award nominated director Mike Figgisamong many others. In addition to the festival programme, Liberatum will present “Just Tell the Truth” short films made by Mike Figgis featuring David Lynch, Marina Abramovic, Jonas Mekas, Paul Auster, John Berger, Sir Peter Blake and Siri Hustvedt. Liberatum will also present a special showcase of legendary photographer’ Guy Bourdin’s work. 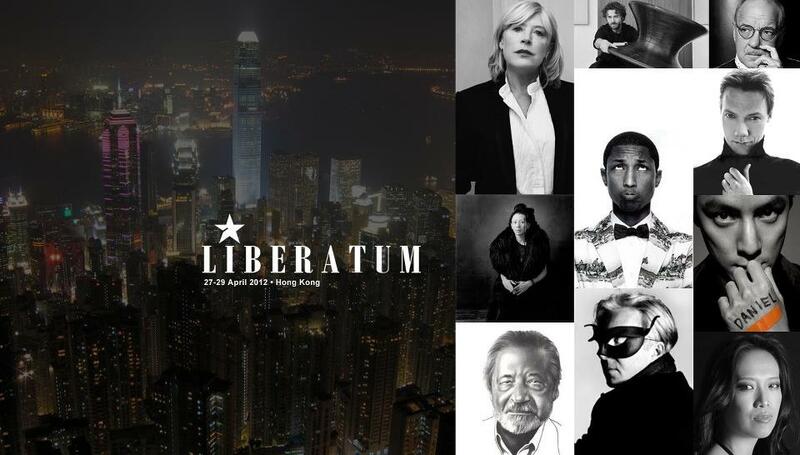 Liberatum Hong Kong promises to be a mesmerising festival of art, design, fashion, literature, film, music and ideas. Building on the achievements of the previous global festivals, our vision is to produce an awe-inspiring three-day cultural convention, featuring a diverse and stimulating programme, and further raising the profile of Hong Kong as a forward-thinking world city. Liberatum HK will enhance the reputation of Hong Kong as a great cultural city and pay tribute to Hong Kong’s cultural heritage. It will present an ambitious and original programme, which will aim to place Hong Kong firmly at the centre of the international cultural scene in 2012. Hong Kong continues to evolve and an event such as Liberatum Hong Kong 2012 will serve to nurture the city’s cultural identity locally and on the world stage. Full programme after the jump…..
My new entry over at CNET Asia Community Blog is up. This week’s entry, “The Dolce & Gabbana Saga in Hong Kong”. Click here for the full read.